Previous Crossfit games have highlighted many athletes as having a weakness when it comes to endurance events. Lower intensity work is often overlooked, but this can have disastrous effects on your performances. Crossfit is a difficult sport to build a program for. There are so many aspects of Crossfit conditioning that must be considered. It is not so different to team sports where there are multiple components required to perform. One thing I believe needs to be addressed is the intensity of a WOD (Workout of the Day). Many believe that if you aren’t redlining or pushing the limit then it’s not tough enough or productive. While skill and strength work may be done at lower intensity, Metcons can be a source of concern. They tend to neglect lower intensity, steady state work. 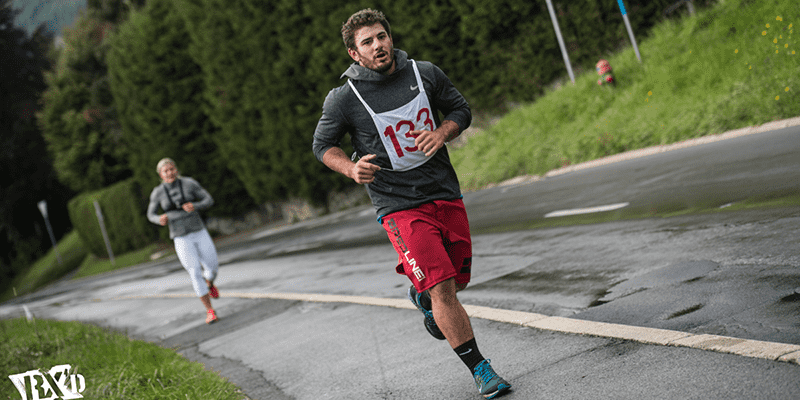 Several big names in Crossfit performed poorly in the endurance style events. 2011, 2012 and 2014 had events which brought some of top competitors to their knees. Our aerobic base is our cruising speed. Our anaerobic and ATP-CP systems are our afterburners. The following graphic shows three athletes. Athlete A has a strong base (Oxidative system), an above average anaerobic capacity (Glycolytic system) and an above average ATP-CP capacity from his HIT training. Athlete B has an above average aerobic system but relies heavily on his superb anaerobic capacity. His ATP-CP stores are again above average. Athlete C is our weekend warrior for comparison. 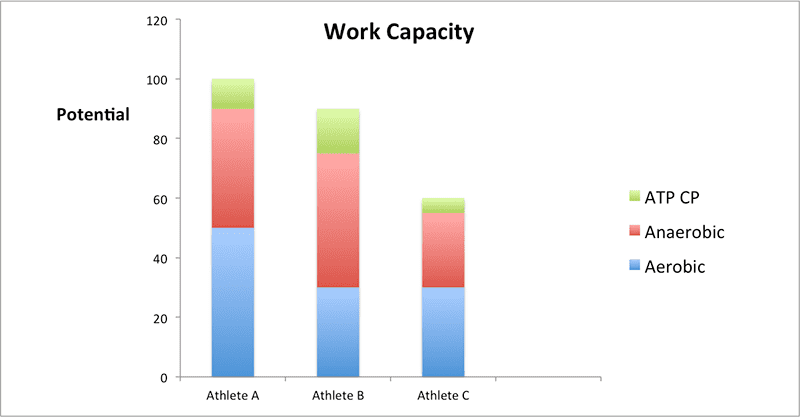 While athlete A and B are quite close in their overall work capacity, Athlete A has a strong oxidative system. He has a high sustainable work capacity. Athlete B almost matches athlete A overall but will never be as competitive when activity is of long duration. He may be able to complete short intense workouts with similar or better performances than athlete A, but can only maintain high intensity for a short period. It is essential for an athlete’s conditioning that some period of his training regime include some LSD style work. This ensures that he has a strong aerobic foundation to build upon. Longer duration, volume style training promotes structural changes which have great benefit to the cardiovascular system. A Crossfitter’s offseason should dedicate some time to long slow, low intensity work. While it may seem boring, the volume plays an important part in promoting structural cardiovascular adapatations. As an athlete draws closer to their competitive season they can reintroduce threshold work and intense Metcons. The point is that some part of their annual plan needs to address this area. Without it we simply lift a ceiling without building a foundation. Jason Khalipa and Chris Hinshaw are both highly regarded in the Crossfit community. They have both been quite vocal of their opinions on being able to rely on the athlete’s engine. A large portion of this engine comes from developing your aerobic capacity. The anaerobic capacity acts almost as tuning for this engine. When WODs exceed the duration of anaerobic capacity the aerobic system is challenged. Previous Crossfit games have highlighted many athletes having a weakness when it comes to endurance events. Athletes of any sport should never neglect their aerobic work. Some are genetically predisposed to a well developed aerobic system, others are not. It can never be taken for granted. It may seem boring and time consuming but it is necessary. Recently the media have given a bad name to LSD style training and cast a shadow over it. While HIT style work can be very effective, exclusively it does not cover everything. Over utilizing it or neglecting other areas will undoubtedly create weaknesses in an athlete’s physiology. In a sport like Crossfit these small holes in an athlete’s capabilities may cost them dearly in competition.